Poor CRM was one of the main factors that caused the fatal accident involving an Airbus A330 at Tripoli Airport, Libya in 2010, according to an investigation by the Libyan Civil Aviation Authority. On May 12, 2010 the Airbus A330-202 passenger plane, operated by Afriqiyah Airways as flight 771, left Johannesburg-O.R. Tambo International Airport (JNB), South Africa on an international passenger flight to Tripoli. There were 11 crew members and 93 passengers on board. The co-pilot was pilot flying. The en route part of the flight was uneventful. The captain contacted the Tripoli ACC controller at 05:29 local time and received clearance direct to Tripoli for a TW locator approach to runway 09. Weather was reported as: wind calm, visibility 6 km, clear sky, temperature/dew point 19/17°C, QNH 1008. After receiving further descent clearances, the crew contacted the Tripoli Tower controller at 05:58. Tripoli Tower notified the aircraft to continue the approach and to report runway in sight. The flight then received information from a flight that had landed ahead of them, informing the accident crew about fog patches noticed during short final. At 06:00 the flight passed the TW locator beacon at an altitude of 1000 feet, after which the captain informed ATC that he would report when runway in sight. The approach was continued below the Minimum Descent Altitude of 620 feet but the crew still did not have the runway in sight. At an altitude of 280 feet the GPWS sounded (‘too low terrain’). The captain then instructed the co-pilot to execute a go-around, after which he informed the Tower controller. The aircraft began to climb, reaching an altitude of 450 feet above ground level. The Airbus then nosed down, causing the captain to take priority over the flight controls by pushing on priority button and the aircraft was fully under the captain’s control who applied a sharp nose down input. The captain did not verbally state that he was taking control. He applied a pitch-up and a pitch-down input on his stick until the airplane impacted the ground. One passenger survived the accident. A final approach carried out in common managed guidance mode should have relieved the crew of their tasks. The limited coordination and cooperation between the two crew members, especially the change into vertical selected guidance mode by the PF, probably led to a lack of a common action plan. 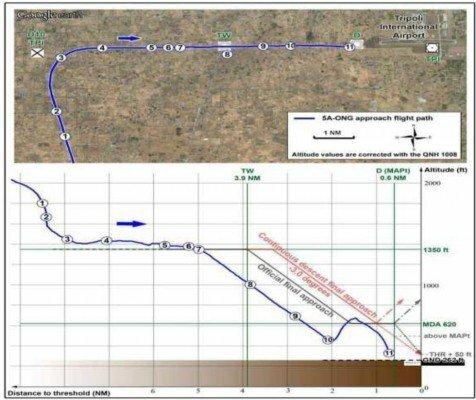 The lack of feedback from the 28 April 2010 flight, flown by the same crew on the same aircraft, did not allow them to anticipate the potential risks associated with managing non-precision approaches. The pilots’ performance was likely impaired because of fatigue, but the extent of their impairment and the degree to which it contributed to the performance deficiencies that occurred during the flight cannot be conclusively determined. During the go-around, the crew was surprised not to acquire visual references. On one hand the crew feared exceeding the aircraft’s speed limits in relation to its configuration, and on the other hand they were feeling the effects of somatogravic illusion due to the aircraft acceleration. This probably explains the aircraft handling inputs, mainly nose-down inputs, applied during the go-around. These inputs were not consistent with what is expected in this flight phase. The degraded CRM did not make it possible for either crew member to identify and recover from the situation before the collision with the ground, even when the TAWS warnings were activated close to the ground. – The lack of common action plan during the approach and a final approach continued below the MDA, without ground visual reference acquired. – The lack of monitoring and controlling of the flight path. – Inappropriate systematic analysis of flight data and feedback mechanism within the AFRIQIYAH Airways. – Non adherence to the company operation manual, SOP and standard terminology. – Weather available to the crew did not reflect the actual weather situation in the final approach segment at Tripoli International Airport. – In adequacy of training received by the crew. – Occupancy of tower frequency by both air and ground movements control.